that speaks when the light falls right from the small aisle windows. as the owls were in the rafters. As old as the crows in the yew grove dark and silent. 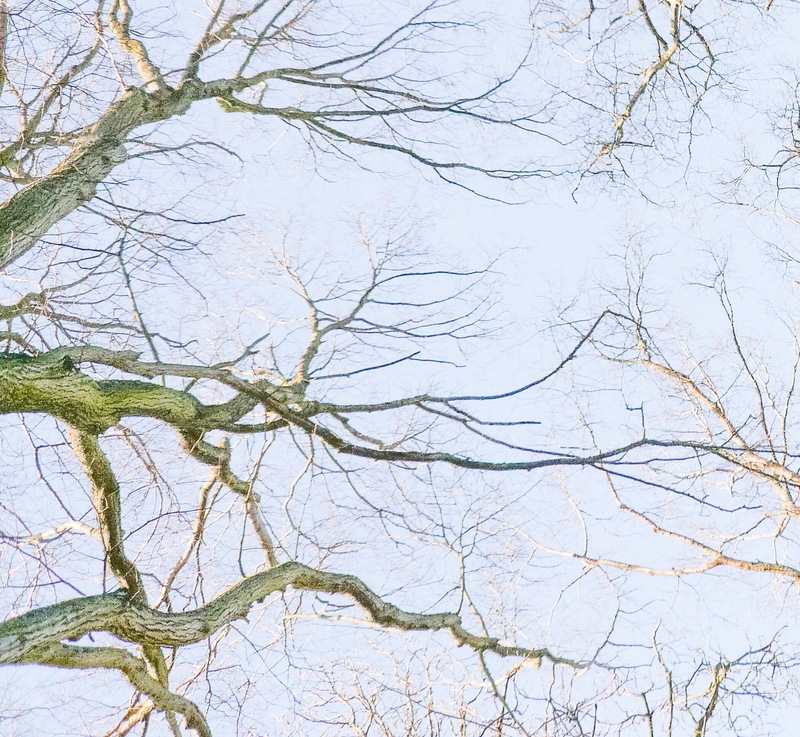 As old as the view perched high, a respite from season’s battles. a barn storing memories and lowing souls. The words slope down, they fall down, bow down. Sorrowful words in proud stone, like the world itself, like the world. long shadows cast between sunlit hills. To be judged and born again as heroes that they were. Nothing here now but sheep tugging at the hillside grasses. Growing and diminishing with shadow fall. It shall not be since it may not be. A bard would waste no time, waste no words. Shattered in cold salt winds. To keep it sound and sovereign. Who should have been king. That the future is a waste land, forever unmade. The roaring, ever-flowering, accumulating past. All that glory, bred from blood and rot. Ground bones to feed the noble good. The Myrddin in us turns away. Our Taliesin mocks the solicitous bards. The histories of truth shall never be written. Fuel for the mysteries of the deeps within. Dreaming of heroes and just cause. And won by losing everything. To become the spiral of eternity. A simple seed buried and buried again. Smothered again, tutored and redacted. The first, the oldest gods, were not heroes. They were farmers and dreamers, dexterous handed. They were mothers and weavers, nursemaids, cooks. Manawydan, king of Britain, best of cobblers. He knew the loud ones take the power, write the stories. Drained by strife and pride, good and bad all cut down. As we drift towards the doors of death. Only goodness or bitterness will remain. The inevitable victory of the insignificant. To count the longer years of the dead. One arch, one door opening onto blue sky. and sheep distant on grazed hills. where the poet robin nests. the wheeling kite the only call to vespers. Blessed by its past and the dreaming dead. A valley wide with flowers, a road ended in tranquillity. 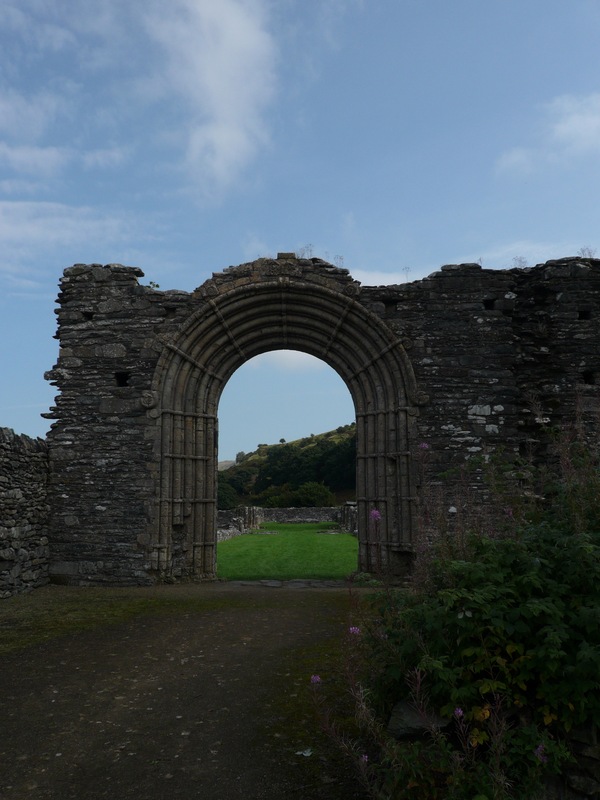 Ystrad Fflur ( pronounced ust rad fleer) is the Welsh name of Strata Florida Abbey in Mid Wales, north-east of Tregaron. It means ‘valley plain of the river Fflur’, but in Latin has become ‘Flower Valley’. Little remains here except an archway and foundations, but the site and location are memorable in their tranquillity and history. 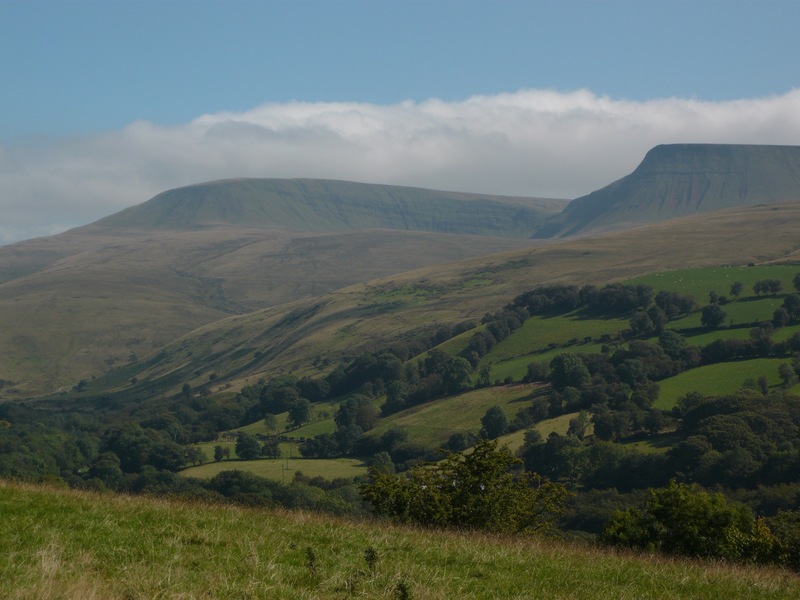 Strata Florida held the official records of the Welsh Kingdoms and actd as the religious heart of the country. 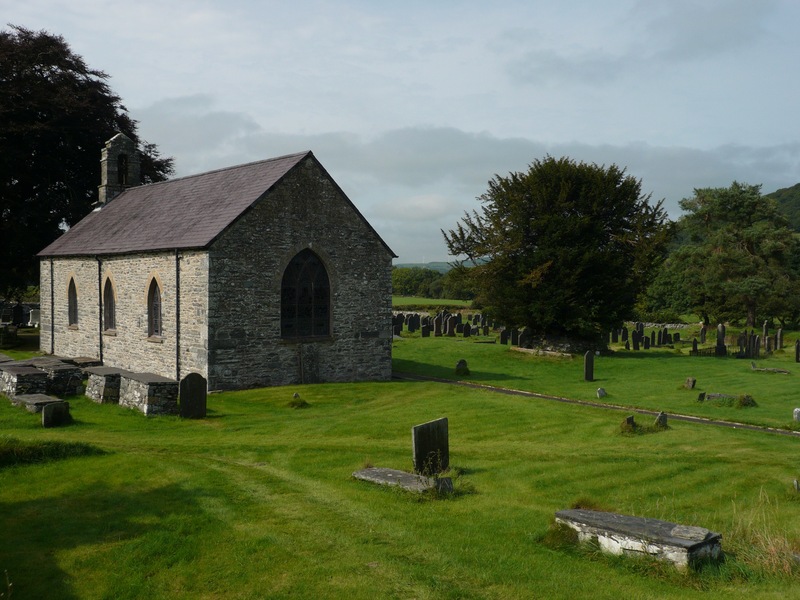 A well-known poet Dafydd ap Gwilym (14th century) is said to be buried under the yew in the churchyard. Deheubarth was the name of the Kingdom here. The Nanteos Cup, believed by some to be a contender for the true Holy Grail, was kept at Strata Florida before the dissolution of the monasteries. It was famed for its miraculous healing powers. We visited on a misty, sunny day in late summer. 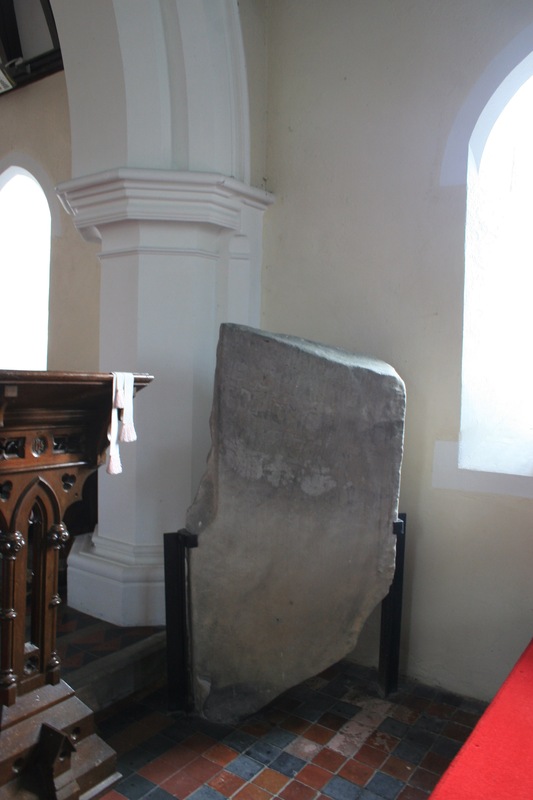 It has a similar atmosphere and sanctified silence to Iona in Scotland, the same intangible presence of history and vigilance. Not forgot though buried deep in heaps across the hills. The buzzard cries and red kite wheels for the recklessness of princes. That cannot ever be owned. Around lost sound and buried names. Those gone before now hood their eyes to listen by the warm hearth of God. Hanging its dark shade by every byre and door. To soothe and polish the grain-edged slate of sorrow. Its throat of rock slaked and scoured. 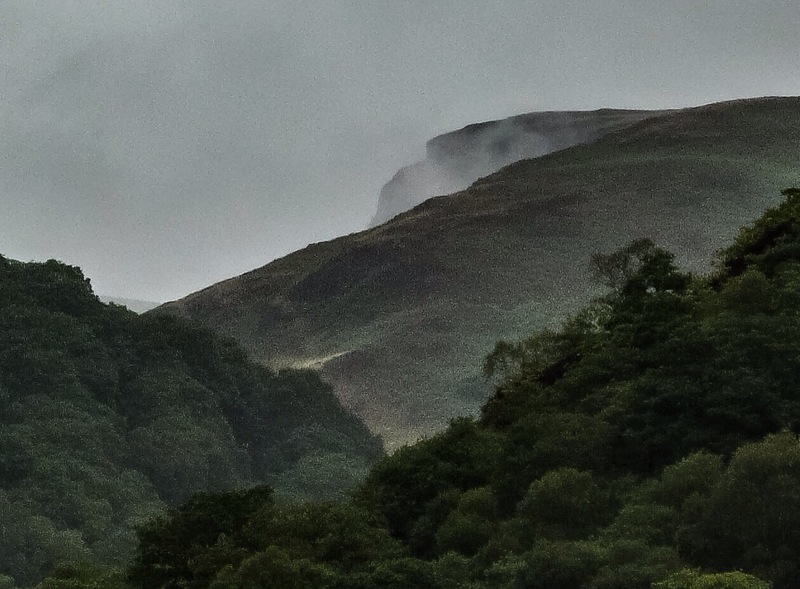 Forever under the big hills staring bare into God’s blank blue face. From each and every early frost. Watched by raven eye and silent nested hare. All beaten down, we have flocked to the cities to be sold for pennies. Huddled there believing safety is numbers from the wilds and curves of the world. Elbowed out, of course, by the mighty. A confluence of dark and light, washed in gravels, the quick dippers and lowing cattle. The old fight between the four corners of the world and the spiral twist of eternity. Forever wanting what is neither this nor that. Forgive the reposting, for some reason some of the like and share buttons did not show on the original post, and I don’t believe it reached many people. I hope this one works….